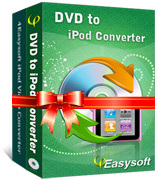 As one of the best video converter for iPod touch, 4Easysoft iPod touch Video Converter allows you to perfectly convert all mainstream video and audio formats such as AVI, MPEG, WMV, MP4, RM, DivX, ASF, VOB, 3GP, etc, to iPod touch formats including MP4 and MP3. So you can upload any video to your Apple iPod touch and watch them whenever and wherever you want! 4Easysoft DVD to iPod Converter is one professional and dazzling DVD iPod Converter, which owns the ability to convert DVD to iPod, DVD to iPod nano, DVD to iPod classic, DVD to iPod touch compatible video formats, like MPEG-4 (.mp4), H.264 (.mp4), MOV, M4V. You are also available to convert DVD to iPhone, Apple TV by using this DVD to iPod Rippper software. 4Easysoft iPhone Ringtone Converter, helpful ringtone converter for iPhone, makes it easy to create or convert iPhone ringtone. With this iPhone Ringtone Converter, no matter the source is video or audio, it can transfer it as iPhone ringtone. And iPhone Ringtone Converter supports formats like MP4, H.264/AVC, AVI, MPEG, WMV, DivX, MKV, RM, MOV, MP3, WMA, WAV, AC3, OGG, RA, M4A, AAC and more. 4Easysoft DVD to iPod Suite comprises of DVD to iPod Ripper and iPod Video Converter, so with the single tool, you can get iPod MP4, H.264, MOV video and MP3, AAC audio from both DVD and video files. The converted files can be used on iPod, iPod touch, iPod nano, iPod classic, iPhone, Apple TV and other MP4 players. 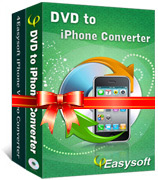 Integrating DVD to iPhone Converter and iPhone Video Converter into the single the single tool, 4Easysoft DVD to iPhone Suite possesses the double function of ripping DVD and converting video. It can rip DVD to MPEG-4 (.mp4), H.264 (.mp4), MOV, MP3, AAC, AIFF, M4A, WAV for iPhone, iPhone OS 3.0. For the Video Converter part, converting any files to iPhone video and extract audio, then convert to audio formats. 4Easysoft iPod Rip, outstanding iPod Ripper software to rip iPod video to Computer, and copy iPod audio to PC directly without iTunes. So it is really convenience for you to backup iPod files to Computer to avoid your iPod losing or iPod files losing or something else. Furthermore, 4Easysoft iPod Rip can display your iPod info automatically, like the iPod type, capacity, version, etc. With this iPod Rip, you are available to browse your iPod library quickly (Genre, Artist, Album). Download the iPod Rip software to backup iPod video/audio on Computer for sharing with your friends and other purpose. 4Easysoft iPhone Rip offers users the chance to handle iPhone files. This iPhone Ripper gives you the way to rip iPhone video to Computer, copy video from iPhone to PC for any occasion, like backup iPhone files for more available capacity, for the losing of your iPhone or something else. In 4Easysoft iPhone Rip, there are more functions to manage your iPhone, it can recognize your iPhone related info as same as iTunes. You also can browse your iPhone library quickly (Genre, Artist, Album). Moreover, This iPhone Rip is applied to iPod. 4Easysoft iPod Manager packs three splendid iPod software: iPod to iPod Manager, iPod to PC Manager and PC to iPod Manager. So it can manage video/audio between two iPods, copy iPod files to Computer directly, and import file/folder to iPod without any help of iTunes or other software. Special functions were added into 4Easysoft iPod Manager, like recognize iPod info, create new playlist or rename it, delete it, search or track iPod filter, including the Genre, Artist, Album and more. It applies to iPhone as well. Easy-to-use 4Easysoft iPhone Manager brings three main functions to you: transfer iPhone to PC, transfer PC to iPhone, and transfer between two iPhone. That's to say, with 4Easysoft iPhone Manager, it takes it easy to backup iPhone files to Computer, export files/folder from Computer to iPhone, and manage video/audio between two iPhone for sharing with your friends or other purpose. 4Easysoft iPhone Manager takes more editing features. It can display your iPhone info automatically, like the iPhone type, capacity, version, etc, create new playlist and edit playlist. In order to find your file quickly, this iPhone Manager can allows you to browse your video/audio easily (Genre, Album, Artist), etc. Moreover, 4Easysoft iPhone Manager is available for iPod. 4Easysoft iPhone Transfer SMS is the specially designed iPhone SMS Transfer for you to copy and backup iPhone SMS to local disk to avoid the missing of your valuable messages or the full message box rejecting to accept new messages. You can directly copy iPhone SMS to computer as .txt files and backup timely iPhone SMS. 4Easysoft iPod + iPhone Mate is the powerful iPod iPhone software to transfer iPod iPhone files and make iPhone ringtone. It actually includes 4Easysoft iPod Manager and iPhone Ringtone Converter. Then you can transfer files between iPod-PC, iPod/iPhone devices and make your own ringtone from your file sources. With iPod Manager, you can backup files from iPod/iPhone devices to PC local without any loss. Import local files to iPod/iPhone directly. Transfer between different devices. iPhone Ringtone Converter is to convert any video/audio files like MP4, H.264/AVC, AVI, MPEG, WMV, DivX, MKV, RM, MOV, MP3, WMA, WAV, AC3, OGG, RA, M4A, AAC to iPhone ringtone M4R, then directly export to iPhone. Owning 4Easysoft iPod Mate, you can enjoy DVDs and any videos on your iPod easily. This iPod Mate software is your best choice to deal with your iPod files. Free download 4Easysoft iPod Mate to explore your iPod digital experiences. Moreover, this iPhone software allows you to rip iPhone to Computer, import PC video/audio to iPhone, between iPhone. The iPhone Ringtone Converter software in 4Easysoft iPhone Mate assists you to create sweet-sounding iPhone ringtone from any video/audio sources. 4Easysoft iPad Rip works as the outstanding iPad Ripper software to rip iPad video to Computer, and copy iPad audio to PC, iPad photo directly without iTunes. So it is really convenience for you to backup iPad files to Computer to avoid your iPod files losing or something else. Furthermore, 4Easysoft iPad Rip can display your iPad info automatically, like the iPad type, capacity, version, etc. With this iPad Rip, you are available to browse your iPad library quickly (Genre, Artist, Album). 4Easysoft iPad Manager works as the all-in-one iPad Manager for you to manage iPad including iPad Video Creator, iPad to PC Manager, PC to iPad Manager. So it can convert DVD/video to iPad, backup iPad files to Computer directly, and import file/folder to iPad without any help of iTunes or other software. 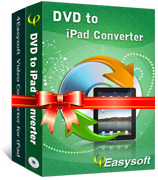 4Easysoft iPad Mate packs four iPad software for iPad/iPod fans, DVD to iPad Converter, Video Converter for iPad, iPad Manager, and iPhone Ringtone Converter, iPhone Transfer SMS. Bundled of these useful tools, 4Easysoft iPad Mate software helps you to convert DVD and video to iPad, manage iPad files by transfering files between iPad and PC without iTunes. Along with the feature to convert video/audio to iPhone M4R ringtone and backup iPhone SMS and contact information. 4Easysoft iPhone 4G Rip can help you rip iPhone 4G audio/video/photo to PC for more available capacity or to avoid losing important files. This iPhone 4G Rip provides you with more functions to manage your iPhone 4G, such as recognizing your iPhone 4G related info, browsing your iPhone 4G library quickly (Genre, Artist, Album), etc. 4Easysoft iPhone 4G Manager, the most professional iPhone 4G Transfer, brings you appealing functions: backup iPhone 4G files to PC, and transfer video/image/music from PC to iPhone 4G. Also it enables you to convert any popular video/DVD to iPhone 4G compatible video and audio formats and make your own iPhone 4G ringtone. 4Easysoft iPhone 4G Mate is packed with DVD to iPhone 4G Converter, iPhone 4G Video Converter, iPhone 4G Manager and iPhone 4G Ringtone Converter. This iPhone 4G Mate can help you convert DVD and video to iPhone 4G MPEG-4 (.mp4), H.264 (.mp4), MOV video, extract iPhone 4 audio from video and DVD, rip iPhone 4G video/audio/image to computer, import PC video/audio to iPhone 4G, and create sweet-sounding iPhone 4G ringtone from any video/audio sources. 4Easysoft iPod + iPhone 4G Mate, including iPod Manager and iPhone 4G Ringtone Converter, is the most powerful iPod iPhone 4G software to transfer transfer files between iPod/iPhone 4 and PC, and make your own iPhone 4G ringtone from your loved music, video and DVD. 4Easysoft ePub to iPhone 4G Transfer, the best iPhone 4G ePub Transfer, can meet all your needs to transfer ePub files between iPhone 4G and PC. It can help you transfer ePub from PC to iPhone 4G and export ePub file to iPhone 4G. What’s more, This ePub to iPhone 4G Transfer can provide you with amazing transferring speed and best output quality.